Youthful, rich dark fruit, berry and cassis aromas meld with notable French oak spice. 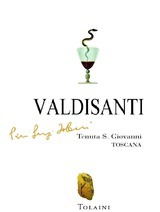 On the palate, Valdisanti is full-bodied with deep but reserved fruit ﬂavors framed by rich oak. The excellent balance of fruit intensity with fine tannins indicates a cellar worthy wine.